Vertebrate pelvic reduction is a classic example of repeated evolution. Recurrent loss of pelvic appendages in sticklebacks has previously been linked to natural mutations in a pelvic enhancer that maps upstream of Pitx1. The sequence of this upstream PelA enhancer is not conserved to mammals, so we have surveyed a large region surrounding the mouse Pitx1 gene for other possible hind limb control sequences. Here we identify a new pelvic enhancer, PelB, that maps downstream rather than upstream of Pitx1. 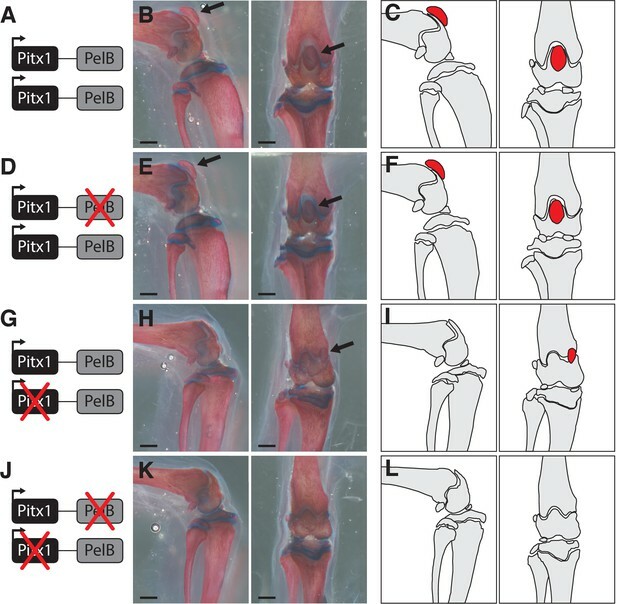 PelB drives expression in the posterior portion of the developing hind limb, and deleting the sequence from mice alters the size of several hind limb structures. PelB sequences are broadly conserved from fish to mammals. A wild stickleback population lacking the pelvis has an insertion/deletion mutation that disrupts the structure and function of PelB, suggesting that changes in this ancient enhancer contribute to evolutionary modification of pelvic appendages in nature. Vertebrate limbs and fins show remarkable morphological diversity (Flower, 1870; Hinchliffe and Johnson, 1980). Extensive limb modifications are seen in animals adapted to running, jumping, swimming, flying, digging, and hunting or evading predators. Of particular interest are species that have undergone dramatic modifications to one set of paired appendages while leaving the other set largely unmodified. For example, bats, birds, and flying fish have greatly elongated pectoral appendages compared to pelvic appendages. Conversely, whales, manatees, and several fish groups have reduced or lost their pelvic appendages, while retaining robust pectoral appendages. 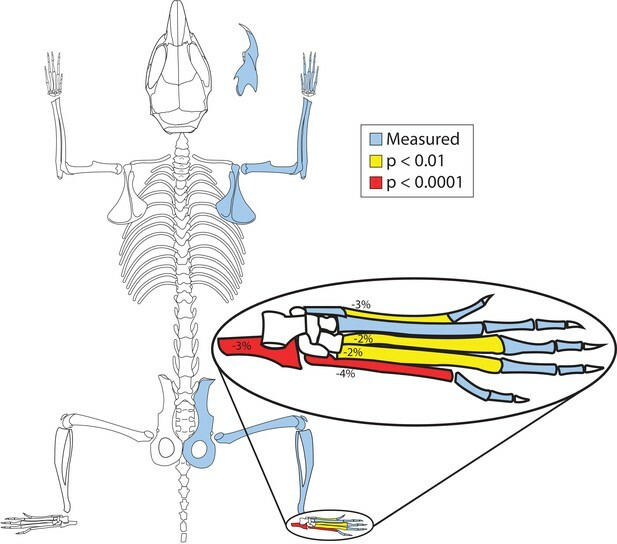 Despite long-standing interest in the processes that lead to species-specific limb differences (Owen, 1849), the detailed genetic changes that underlie vertebrate limb modifications are still largely unknown. Numerous signaling and transcription factor pathways have been identified that play a key role in limb development (reviewed in Zuniga, 2015; Petit et al., 2017). Though most of these factors are expressed in both the fore- and hind limbs, some are limb-specific. Tbx5 is expressed in the developing forelimb (Gibson-Brown et al., 1996), and complete loss of this gene prevents proper forelimb outgrowth (Ahn et al., 2002; Garrity et al., 2002). By contrast, Tbx4 is expressed specifically in the developing hind limb (Chapman et al., 1996), and loss of one or both copies results in significant hind limb defects (Naiche and Papaioannou, 2003; Bongers et al., 2004; Naiche and Papaioannou, 2007). Another hind limb-specific gene is Pitx1, which encodes a homeodomain transcription factor that acts upstream of Tbx4 (Logan and Tabin, 1999). The hind limb-specific expression pattern of Pitx1 is conserved in many different vertebrates, including fish, birds, and mammals (Lanctôt et al., 1997; Logan et al., 1998; Shapiro et al., 2006). Pitx1 is clearly required for normal hind limb development in mammals, as Pitx1 knockout mice show reduced hind limb size, complete loss of the ilium and patella, and altered shape of the remaining hind limb bones (Lanctôt et al., 1999; Szeto et al., 1999). Mutations in the Pitx1 gene or its surrounding regulatory regions are also associated with avian foot feathering (Domyan et al., 2016) and several human limb abnormalities, including polydactyly (Klopocki et al., 2012), Liebenberg syndrome (Spielmann et al., 2012), and familial clubfoot (Gurnett et al., 2008). In addition to its role in hind limb development, the Pitx1 gene is also expressed and required in several other tissues. Mice with a complete knockout of Pitx1 die soon after birth with pituitary gland abnormalities, shortened jaws, and cleft palate (Lanctôt et al., 1999; Szeto et al., 1999). Although complete loss of Pitx1 is clearly deleterious, previous studies suggest that regulatory changes in Pitx1 have also contributed to adaptive evolution of new skeletal traits in wild species. Genetic crosses between wild stickleback fish have shown that Pitx1 is a major effect locus controlling pelvic reduction that has evolved repeatedly in many freshwater populations (Cresko et al., 2004; Shapiro et al., 2004; Coyle et al., 2007). High-resolution genetic mapping and enhancer studies identified a non-coding regulatory sequence located upstream of Pitx1, called Pel, that drives expression specifically in the developing pelvic hind fin (Chan et al., 2010). The Pel enhancer has been independently deleted in many pelvic-reduced freshwater populations, accompanied by molecular signatures of positive selection centered around the Pel deletions (Chan et al., 2010). Reintroduction of Pel-driven Pitx1 can restore pelvic development in pelvic-reduced sticklebacks, providing strong evidence that regulatory changes in Pitx1 underlie the repeated loss of pelvic hind fins in wild sticklebacks (Chan et al., 2010). Although the hind limb-specific expression pattern of Pitx1 is conserved across vertebrates, the primary sequence of the stickleback Pel enhancer is not. Pel enhancer orthologs can be identified in other fish, but not in most other vertebrates, including mammals (Chan et al., 2010). Conversely, genetic studies in birds, mice, and humans suggest multiple upstream regions may be involved in Pitx1 limb expression, but it has been difficult to identify any individual Pitx1 enhancers that drive hind limb-specific expression (Pennacchio et al., 2006; Spielmann et al., 2012; Domyan et al., 2016; Kragesteen et al., 2018; Sarro et al., 2018). To identify possible mammalian hind limb enhancers in Pitx1, we have now surveyed a large region surrounding the mouse Pitx1 locus for sequences that drive limb expression in transgenic mice. Here we identify a novel pelvic enhancer located downstream rather than upstream of Pitx1, which shows conservation of both sequence and function from mammals to fish. Genetic studies suggest this sequence influences development of a subset of normal hind limb features in mice, and has also contributed to evolutionary pelvic reduction in natural populations. To identify regulatory sequences that drive limb expression in developing mouse embryos, we surveyed an 850 kb region of the Pitx1 locus using overlapping mouse BAC clones that cover the entire Pitx1 coding region as well as flanking regions (Figure 1). Note that the scan includes 607 kb of sequence upstream of the Pitx1 coding region. The known Pel enhancer maps upstream of the stickleback Pitx1 gene (Chan et al., 2010), and although a mammalian Pel ortholog cannot be identified by sequence alignment, it is possible that a functionally conserved Pel enhancer also resides in the same upstream region in mammals. Two large deletions associated with human forelimb abnormalities also map upstream of the Pitx1 gene (Figure 1). Both deletions remove the flanking H2afy gene and bring a far upstream enhancer called hs1473 closer to the human Pitx1 gene (Spielmann et al., 2012). The hs1473 enhancer can drive gene expression in both forelimbs and hind limbs (Pennacchio et al., 2006), and has hence been named the pan-limb enhancer or Pen (Kragesteen et al., 2018). Ectopic expression of Pitx1 in forelimbs likely causes the arm-to-leg-like morphological abnormalities characteristic of human Liebenberg syndrome (Spielmann et al., 2012; Kragesteen et al., 2018). A deletion associated with lowered Pitx1 expression in hind limbs and feathered feet in birds also maps upstream of the H2afy gene (Domyan et al., 2016). A BAC scan across the Pitx1 locus. (A) Schematic of a genomic region surrounding Pitx1 (red). Note that the transcriptional orientation of the Pitx1 gene is from right to left in this view (arrow). Black bars show BAC locations. Gray bars denote orthologous positions of other known or suspected cis regulatory regions, including: sequences removed by the avian deletion associated with feathered feet in pigeons (Domyan et al., 2016), the PDE element (Sarro et al., 2018), the Pit enhancer (Kragesteen et al., 2018), human deletions associated with Liebenberg syndrome (Spielmann et al., 2012), and the hs1473 limb enhancer (Pennacchio et al., 2006; Spielmann et al., 2012), now also referred to as the pan-limb enhancer, or Pen (Kragesteen et al., 2018). (B-P) Whole-mount lacZ staining of transgenic embryos carrying RP23-55J18 (B-D), RP24-296G14 (E-G), RP24-353M13 (H-J, only left side of embryo showed limb staining), RP23-231P13 (K-M), or RP23-233P6 (N-P), with close ups of the forelimb (‘FL’) and hind limb (‘HL’) below. Dotted lines denote boundaries of limbs. In our initial screen, two different BAC clones drove lacZ expression in the pituitary gland, a well-known site of endogenous Pitx1 expression (BACs RP24-296G14 and RP24-353M13, see Supplementary file 1A). These two BACs overlap in a 29 kb region, suggesting this shared region may contain a pituitary enhancer. Interestingly, this shared region also contains a sequence called the Pitx1 Distal Enhancer (PDE, Figure 1), a region that shows significant chromatin interactions in limb tissues with the promoter of Pitx1 (Sarro et al., 2018). This region has been knocked out in mice, leading to modest reductions in Pitx1 expression in limbs and mandibles, but no detectable limb or jaw skeletal phenotypes (Sarro et al., 2018). Possible effects on pituitary development and expression were not reported in PDE knockout mice. However, a 2.5 kb subregion of the PDE region can drive consistent expression in the developing pituitary, and this region has now been named the Pit enhancer (Kragesteen et al., 2018). Three different BAC clones drove lacZ expression in the developing forelimb (Figure 1C,I,O). However, only one of these clones, BAC RP23-55J18, also drove prominent expression in the hind limb. With this clone, lacZ expression was observed at the proximal end of the forelimb autopod (Figure 1C), as well as the posterior side of the hind limb autopod (Figure 1D). Although the expression driven by RP23-55J18 was not specific to the hind limb, it is possible that multiple limb enhancers exist in the Pitx1 region, and that the overall pattern represents the combined activity of separate forelimb and hind limb enhancers. Previous studies suggest that evolutionarily conserved sequences and tissue-specific chromatin marks can often be used to identify tissue-specific enhancers (Fortini and Rubin, 1990; Mortlock et al., 2003; Woolfe et al., 2005; Pennacchio et al., 2006). To further test for possible hind limb enhancer regions within the interval covered by BAC RP23-55J18, we looked for conserved regions that also showed increased chromatin accessibility or H3K27ac marks in hind limb tissues relative to forelimb (Figure 2 and Figure 2—figure supplement 1). We subcloned several of these regions upstream of a lacZ reporter and tested whether these sequences were capable of driving reporter gene activity at consistent locations in transgenic mice. A novel pelvic enhancer downstream of Pitx1. (A) Schematic of genomic region encompassing Pitx1 (black), with flanking genes (gray). Black bars mark the location of the BAC RP23-55J18 and smaller enhancer constructs. Forelimb (FL) and hind limb (HL) DNaseI hypersensitivity tracks from ENCODE are shown (Rosenbloom et al., 2013), along with vertebrate sequence conservation (Blanchette et al., 2004). (B-D) Whole-mount lacZ staining of transgenic embryos carrying PelB enhancer constructs, with close ups of the limbs. Dotted lines denote boundaries of limbs. A 9466 bp region downstream of Pitx1, and located within a large intron of the Pcbd2 gene, contains multiple conserved sequences with increased DNaseI accessibility during hind limb development (Figure 2A). Chromosome conformation capture experiments (Andrey et al., 2017) show that this region directly interacts with the Pitx1 promoter in hind limbs but not forelimbs of developing mouse embryos, consistent with the region serving as a possible Pitx1 enhancer (Supplementary file 1B). The same region is enriched for H3K27ac signal in developing hind limbs versus forelimbs of both mouse and lizard embryos (Infante et al., 2015), suggesting the region may contain evolutionarily conserved hind limb enhancer activity (Figure 2—figure supplement 1). A lacZ expression construct containing this region drove strong and reproducible lacZ expression in the hind limbs but not forelimbs of transient transgenic E12.5 embryos (Figure 2B). Strongest expression was observed in the posterior half of the developing autopod, with weaker expression also seen at the proximal junction of hind limb and body wall. We designated the full 9466 bp fragment pelvic limb enhancer B (PelB). A 2173 bp subregion (PelBcon1), containing a hind limb-enriched open chromatin domain and sequence conservation through amphibia, exhibited the same proximal expression as the full-length fragment (Figure 2C). A separate, non-overlapping 3280 bp subregion (PelBcon2), with a strong hind limb-enriched DNase peak and sequence conservation through teleosts, exhibited the same autopod pattern as the full-length fragment (Figure 2D). To test whether PelB is required for normal hind limb development, we used CRISPR/Cas9 targeting to delete a 9425 bp region from the endogenous mouse locus, encompassing virtually the entire PelB region tested in the lacZ assay (see Materials and methods). The deletion allele was transmitted through the germline, and subsequent crosses showed that PelB heterozygotes and homozygotes were born in expected Mendelian ratios, and showed normal viability and fertility. Quantitative RT-PCR experiments of developing wild type and PelB homozygous mutant embryos showed that loss of the PelB enhancer reduced Pitx1 levels to approximately 85% of control levels in E12.5 hind limbs (p<0.05, Supplementary file 1C). In contrast, no significant change was seen in Pcbd2 expression (Supplementary file 1C). These results suggest that PelB acts as an enhancer of the Pitx1 gene during normal development, but that additional control regions also must contribute to overall levels of Pitx1 hind limb expression. To identify possible effects of PelB enhancer loss on hind limb development, we analyzed bones of adult Pitx1PelB-/PelB- mice and control mice. One Pitx1PelB-/PelB- mouse exhibited right hind limb preaxial polydactyly, an alteration known to occur at low background rates in the C57BL/6J mouse background (Dagg, 1966). This mouse was excluded from further analysis. No other major changes in the number, or presence or absence of hind limb, forelimb, or jaw bones were apparent in Pitx1PelB-/PelB- animals as compared to wild type. However, significant quantitative reductions were seen in the length of several hind limb bones in the homozygous PelB mutant mice, confirming that the PelB enhancer sequence is required for normal developmental size of hind limb structures (Figure 3, Supplementary file 1D). PelB deletion mice have smaller hind feet. Bones with significant length changes between control (Pitx1+/+) and enhancer knockout (Pitx1PelB-/PelB-) mice are highlighted (Blue = measured, Yellow = p < 0.01, Red = p < 0.0001). Numbers indicate percent change in mean length. (Pitx1+/+ n=21, Pitx1PelB-/PelB- n = 20). To test whether PelB deletion has additional phenotypic effects in a sensitized background with lower levels of Pitx1, we crossed Pitx1PelB-/PelB- animals to mice heterozygous for a functional knockout mutation that disrupts the protein-coding region of the Pitx1 gene (Pitx1null/+) (Szeto et al., 1999). Pitx1null/null mice show severe hind limb deformities, facial abnormalities, and neonatal lethality (Lanctôt et al., 1999; Szeto et al., 1999). By contrast, heterozygous Pitx1null/+ mice are reported to be phenotypically normal, with a small percentage exhibiting a club foot phenotype (Alvarado et al., 2011). We compared Pitx1null/PelB- mice to Pitx1null/+ to determine if loss of the PelB sequence alters hind limb development. All heterozygous carriers of the Pitx1 null mutation were smaller than non-carriers, with significant reduction of jaw and several hind limb elements after correcting for body size (Supplementary file 1E). In addition, Pitx1null/PelB- mice showed significant reductions in length of the jaw and several hind limb bones compared to Pitx1null/+ animals (Supplementary file 1F). The most striking phenotype was a complete absence of patellae in Pitx1null/PelB- mice (Figure 4K,L). For comparison, patellae are completely missing in Pitx1null/null mice (Lanctôt et al., 1999; Szeto et al., 1999) and are smaller but consistently present in the Pitx1null/+ heterozygous animals in our crosses (Figure 4H,I). Patellae are found in hind limbs but not forelimbs of many vertebrates (Samuels et al., 2017), and loss of the patella in the compound crosses suggests that PelB also contributes to the development of this structure. Loss of patellae in mice missing the PelB enhancer and one functional copy of Pitx1. (A,D,G,J) Gene diagrams showing the status of the PelB enhancer and Pitx1 coding region produced by crossing PelB knockout and Pitx1 null mutant lines. (B,E,H,K) Mouse knee joint, with patellae indicated with a black arrow. Scale bars = 1 mm. (C,F,I,L) Outlines of bones, with patellae highlighted in red. Because of the high sequence conservation of PelB across vertebrates, we tested whether the orthologous sequence from teleosts can also function as an enhancer in developing pelvic appendages. Stickleback PelB shows 51% identity to mouse PelB over a core 530 bp region. We cloned the PelB sequence from a marine stickleback population (Salmon River PelB; SALR-PelB) upstream of a GFP reporter, and injected the reporter construct into fertilized eggs of pelvic-complete sticklebacks. Transient transgenic larvae are readily identifiable by GFP expression driven by the reporter vector itself in the lens of the eye (Nagayoshi et al., 2008). The SALR-PelB constructs drove consistent GFP expression in the developing pelvic spines and girdle (Figure 5B). Interestingly, very strong GFP was also observed in the developing jaw region, another site of normal Pitx1 expression (Shapiro et al., 2004). We note that the 530 bp region contains many predicted transcription factor binding sites, including a putative Pitx1 binding domain (Figure 5—figure supplement 1–3), which may contribute to the tissue-specific pattern. PelB enhancer function is conserved to fish. (A) Schematic of enhancer constructs tested in stickleback fish. Each enhancer was cloned as a 2x concatemer upstream of an hsp70 promoter and eGFP. The marine sequence is from the Salmon River (SALR) population, and the lake sequence is from Paxton benthic (PAXB). (B-C) GFP fluorescence in live sticklebacks. GFP expression in the lens of the eye (e) is driven by the hsp70 promoter itself, allowing easy identification of transgenic fish. (B) The marine PelB enhancer drives expression in the jaw (j) and pelvis (p). (C) The lake PelB enhancer drives similar expression in the jaw (j), but significantly less expression in the pelvis (p), as well as a novel expression in the fin rays (f). 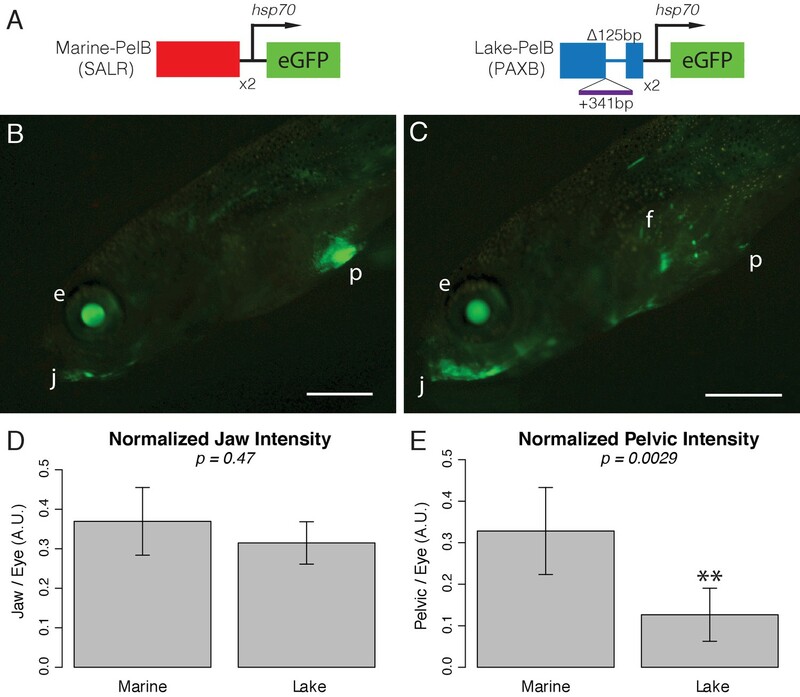 (D-E) Quantified fluorescence in GFP-positive fish that show pelvic expression, normalized to intensity in the lens of the eye to control for copy number and integration site. SALR n = 24, PAXB n = 18. Scale bars = 1 mm. To determine whether PelB sequences are modified in wild populations with evolutionary changes in pelvic hind fin development, we sequenced PelB from multiple freshwater stickleback populations that show loss or reduction of pelvic structures. We observed multiple sequence variants and small indels in the region, most of which did not correlate with pelvic status (Figure 5—figure supplement 1–3). However, one stickleback population with extreme pelvic reduction (Paxton Lake benthic, PAXB) showed a large compound indel in the PelB region (Figure 5, Figure 5—figure supplement 1–3 for full sequence). The PAXB population is interesting, as it exhibits one of the most extreme examples of pelvic loss, with most PAXB fish showing no pelvic bones at all (McPhail, 1992), and also has a known deletion in the previously identified Pel region located upstream of Pitx1 (Chan et al., 2010), which we now refer to as PelA. PAXB fish have a deletion of 125 bp and an insertion of 341 bp in the PelB sequence. The inserted sequence is nearly identical to a region located approximately 3 kb upstream of the PelB region, suggesting the allele arose by concurrent duplication and local insertion of DNA. To determine whether this indel mutation alters the function of PelB, we tested the enhancer activity of PAXB-PelB in pelvic-complete stickleback embryos in the GFP reporter assay. As with the marine construct, PAXB-PelB drove very strong, consistent reporter expression in the eye and jaws of transgenic fish (Figure 5C,D, Figure 5—figure supplement 4). However, the PAXB-PelB construct drove weak and limited expression in the developing pelvic region compared to controls, a difference that we confirmed by quantitative measurement of the extent of GFP expression in many independent transgenic larvae (Figure 5C,E). Interestingly, PAXB-PelB also exhibited novel expression in the developing pectoral fin rays, a pattern not observed with the marine construct. 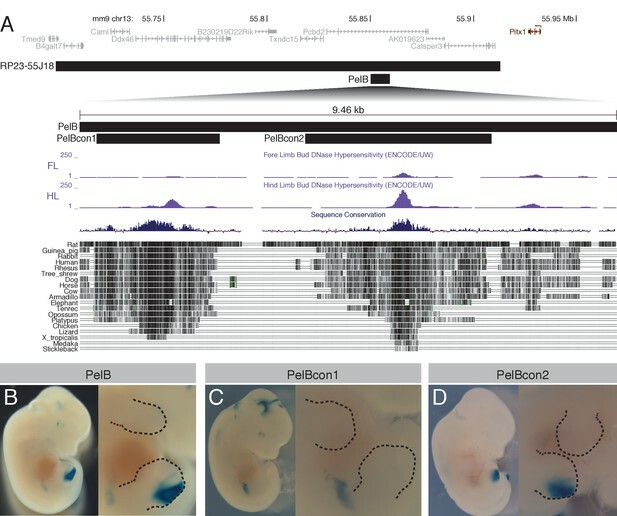 The novel deletion and insertion of sequence in the PAXB-PelB region thus leads to both reduction of enhancer activity in the pelvis, and gain of new activity in other fin rays. Despite the key role of the Pitx1 gene in specification of hind limb identity and development, the sequences controlling its normal expression pattern are still poorly understood. While an upstream pelvic-specific enhancer (PelA) was previously identified in sticklebacks (Chan et al., 2010), this sequence is not well conserved outside teleosts. Regulatory mutations in birds, humans, and mice implicate multiple 5' upstream regions in Pitx1 regulation (Spielmann et al., 2012; Domyan et al., 2016; Kragesteen et al., 2018), and several enhancers have now been identified in the upstream regions that are well conserved in tetrapods but not fish (Spielmann et al., 2012; Sarro et al., 2018; Kragesteen et al., 2018). Although multiple sequences in the mouse 5' region clearly contribute to overall Pitx1 expression, no individual enhancer from the upstream region can recapitulate hind limb-specific expression, and knockouts of single upstream enhancers lead to incomplete reduction of hind limb expression, and mild or undetectable hind limb phenotypes (Kragesteen et al., 2018; Sarro et al., 2018). We have now identified a novel enhancer from the mammalian Pitx1 gene that is located downstream rather than upstream of Pitx1 coding exons, in a region that is also known to interact directly with the Pitx1 promoter during hind limb development (Andrey et al., 2017; Kragesteen et al., 2018; Supplementary file 1B). This is the first mammalian enhancer from the Pitx1 region that can drive hind limb-specific rather than pan-limb expression. PelB is also highly conserved between mice and sticklebacks, suggesting that ancient genomic mechanisms controlling expression of Pitx1 in pelvic appendages already existed in the common ancestors of tetrapods and fish. 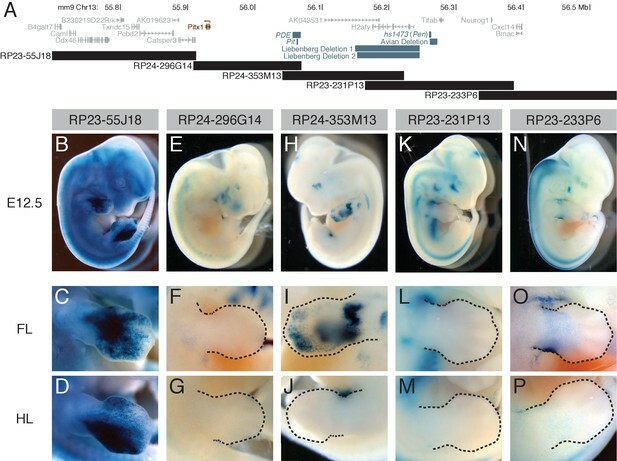 Although the PelB enhancer shows strong hind limb specific expression in the developing mouse embryo, the expression pattern is restricted to the posterior side of the autopod. By contrast, the endogenous Pitx1 gene is expressed throughout the developing hind limb (Szeto et al., 1999; Sarro et al., 2018), suggesting that other control sequences also must contribute to Pitx1 regulation. Knockout of PelB leads to only partial reduction of Pitx1 expression in hind limbs, as expected if other enhancers are also involved in Pitx1 regulation. Recent studies show that deletion of 5' regulatory regions can also lead to reproducible but incomplete reduction of Pitx1 expression in hind limbs, showing that multiple control sequences located both downstream and upstream of Pitx1 are required for normal expression (Kragesteen et al., 2018; Sarro et al., 2018). Our phenotypic studies in mice show that loss of the PelB enhancer also leads to milder hind limb phenotypes than inactivation of the Pitx1 gene itself. 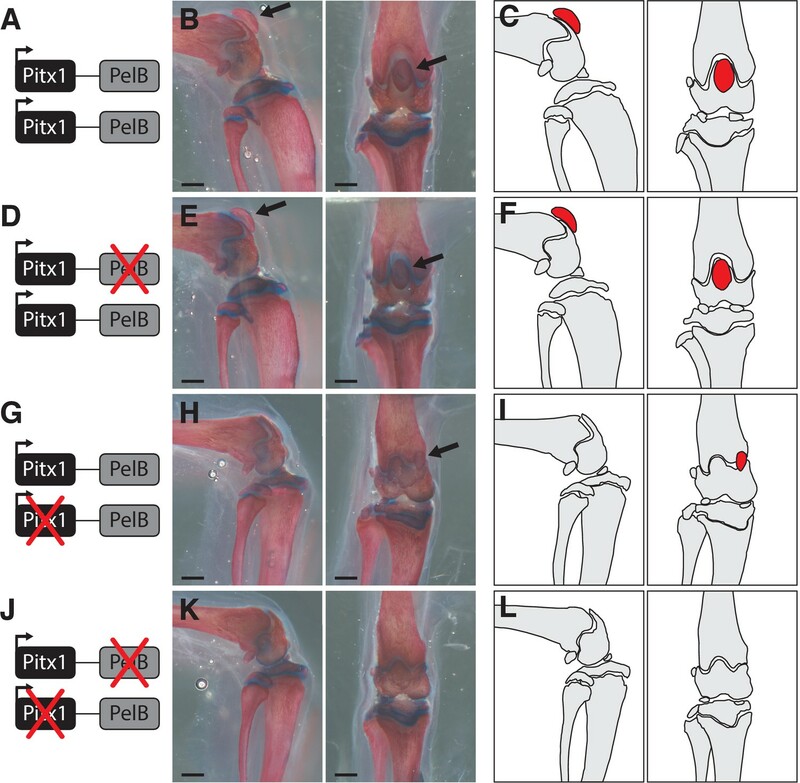 However, loss of the PelB enhancer alone significantly reduces the length of several hind limb bones, and loss on a sensitized background with a heterozygous Pitx1 null mutation leads to complete loss of the patella. These studies confirm that the PelB enhancer is required for normal pelvic hind limb development in mammals, but has larger phenotypic effects on some hind limb structures than others. The patella is a large sesamoid bone embedded in the tendon connecting the femur and tibia (Samuels et al., 2017). Embryological studies show that the patella arises from dorsal limb bud mesenchyme cells and requires muscular contraction for normal development (Eyal et al., 2015). It is possible that PelB expressing cells in the posterior limb bud contribute descendants to the dorsal limb bud domain that forms the patella, or to domains that form more anterior skeletal structures. For comparison, previous fate mapping experiments have shown that the descendants of Shh expressing cells in the posterior limb bud expand and contribute to multiple skeletal structures outside the initial expression domain (Harfe et al., 2004). Alternatively, loss of the PelB enhancer could have indirect effects on either the patella or more anterior skeletal structures, for example by altering overall chromatin configuration of the Pitx1 locus (Kragesteen et al., 2018) and thus changing additional Pitx1 expression domains, by perturbing cell non-autonomous signaling pathways involved in limb formation, or by altering patterns of muscular activity that also influence formation of some skeletal structures. In the future, these possibilities can be further tested by mapping the developmental fate of PelB expressing cells in limb buds, by using chromosome conformation approaches to study the configuration of the Pitx1 locus in mice missing the PelB enhancer, or by looking for additional expression and anatomical changes in PelB mutants, including possible changes in non-skeletal tissues like muscle. Recent studies (Osterwalder et al., 2018) have proposed that many vertebrate genes have multiple ‘functionally redundant’ enhancers that drive similar patterns in a particular tissue, with each enhancer making purely quantitative contributions to the overall level of expression of a gene. Some of our results superficially appear to fit this model, including the existence of multiple enhancers that contribute to Pitx1 expression in developing pelvic appendages (such as the two separate pelvic control regions, PelA and PelB, now identified in the fish Pitx1 gene), and obvious presence/absence phenotypes that are seen only when enhancer knockouts are analyzed on sensitized rather than wild type backgrounds (such as complete loss of the patella seen in Pitx1null/PelB- but not Pitx1PelB-/PelB- mice). At the same time, our studies provide multiple lines of evidence indicating that Pitx1 enhancers are not truly redundant. First, while PelB is active in the hind limbs of mice, it is clearly not active throughout the entire hind limb, as might be expected if it was making a purely quantitative contribution to the overall Pitx1 hind limb pattern. Similar results have been seen for other genes with a key role in hind limb or skeletal development. For example, two different hind limb enhancers have previously been identified in the Tbx4 gene of mammals (HLEA and HLEB). Although these two enhancers drive expression patterns that overlap in some regions of the hind limb, each enhancer also has unique spatial expression patterns not shared with the other enhancer (Menke et al., 2008; Infante et al., 2015). Second, significant phenotypes are seen in laboratory animals engineered to lack individual enhancers, a result that clearly demonstrates the enhancers are not functionally redundant at the organismal level. These phenotypes may be quantitative rather than qualitative (such as length changes rather than presence or absence of metatarsals), or restricted to particular subsets of anatomy, or only revealed under particular environmental conditions (Frankel et al., 2010). We note that similar results have also been reported for the two different hind limb enhancers of the Tbx4 gene. Knockout of HLEA alone produces significant changes in length of hind limb elements, even if additional, or more severe, phenotypes are detected when analyzed on a genetic background heterozygous for a Tbx4 null mutation (Menke et al., 2008; Infante et al., 2015). Third, mutations of individual Pitx1 enhancers have clearly made significant contributions to adaptive evolution of skeletal phenotypes in wild populations. Many pelvic-reduced sticklebacks show complete deletion of the PelA but not the PelB enhancer in natural environments, as well as molecular signatures of adaptive selection that are centered on the PelA region (Chan et al., 2010). These results suggest that loss of the PelA enhancer alone is sufficient to produce evolutionarily significant pelvic reduction in some wild populations. Because the PelA enhancer of sticklebacks is alignable in fish but not tetrapods, while the Pen enhancer is found in tetrapods but not fish, it has recently been proposed that hind limb specific regulation of Pitx1 may have arisen by different mechanisms in fish and tetrapod lineages (Kragesteen et al., 2018). Within tetrapods, the Pen enhancer also drives expression in both forelimbs and hind limbs unless silenced by other elements, raising the possibility that the ancestral form of Pitx1 expression was actually pan-limb rather than hind limb-specific, and that distinct Pitx1 expression patterns and distinct morphology of forelimbs and hind limbs evolved as subsequent events in the tetrapod lineage (Kragesteen et al., 2018). In contrast, our data identify a Pitx1 enhancer whose sequence is clearly conserved between fish and mammals, and that also drives expression in pelvic rather than pectoral appendages when functionally tested in both sticklebacks and mice. These data show that pelvic-appendage-specific enhancers of the Pitx1 gene are a shared and ancient genomic feature that already existed in the common ancestor of both fish and land animals. An ancient and ancestral PelB-based regulatory mechanism may have subsequently been modified by evolution of separate lineage-specific PelA and Pen-based regulatory sequences in teleost fish and tetrapods. Alternatively, PelA-like and Pen-like functions may also be ancient like PelB, even though the primary sequence of these enhancers are no longer alignable because of turnover of binding sites at the DNA sequence level (Dermitzakis and Clark, 2002; Wray et al., 2003). We note that the existence of ancient shared enhancers in limb identity genes like Pitx1 is consistent with the fossil record of fin and limb evolution. Genetic programs for producing morphologically distinct pectoral and pelvic appendages have clearly existed since early periods of vertebrate evolution, as shown by the distinct morphologies of pectoral and pelvic fins in stem gnathosomes, as well as the distinct forelimb and hind limb morphologies of stem tetrapods (Coates, 2003; Zhu et al., 2012; Shubin et al., 2014; Jeffery et al., 2018). Identification of the evolutionarily conserved PelB hind limb enhancer in the Pitx1 gene will facilitate additional studies of limb development in a wide range of vertebrate species. For example, hind limb and patellar abnormalities are relatively common in humans (Bongers et al., 2005; Zhang et al., 2017; Basit and Khoshhal, 2018). The sequence of the PelB region can now be examined for base pair changes, insertions, deletions, or copy number differences that may contribute to morphological traits or disease phenotypes in humans. Our data in sticklebacks already provide one clear example of PelB sequence changes that are linked to dramatic changes in pelvic structures in natural populations. Benthic sticklebacks from Paxton Lake in British Columbia show almost complete loss of the pelvic apparatus, one of the key skeletal differences that distinguish the classic benthic-limnetic species pair found within this lake (McPhail, 1992). In previous genetic crosses with Paxton benthic fish, most of the variation in pelvic size has been linked to a 300 kb region surrounding the Pitx1 locus (Shapiro et al., 2004; Chan et al., 2010). Here we show that PAXB fish have dual mutations in two different pelvic enhancers of the Pitx1 gene. While the PelA enhancer is completely deleted (Chan et al., 2010), the PelB enhancer shows both a 125 bp deletion and a 341 bp insertion in PAXB fish. We have confirmed that these large structural changes reduce the hind limb enhancer activity of the PelB enhancer in transgenic reporter assays, and also generate a novel expression pattern in developing rays of the pectoral and median fins. Paxton benthic fish do not show distinctive morphologies in their pectoral and median fins compared to other freshwater sticklebacks, though it is possible that subtle morphological changes have been missed. In contrast, the dual mutations in both PelA and PelB in Paxton benthic fish likely contribute to the nearly complete loss of the pelvic apparatus in this population, compared to the partial pelvic reduction observed in many populations missing only the PelA enhancer. In the future, it will be interesting to engineer fish that carry only the PelA deletion, only the PelB alteration, or alterations in both sequences upstream and downstream of the Pitx1 locus. This will make it possible to reconstruct the phenotypic contributions that each enhancer makes to different structures within the pelvic fin, and to the overall size of pelvic appendages in a fish model of skeletal evolution. Many other vertebrates show interesting skeletal changes in hind limbs, forelimbs, or both. Initial examination shows that the primary sequence of PelB is largely intact in whales and manatees (Figure 2—figure supplement 2). As minor sequence alterations in transcription factor binding sites can dramatically alter enhancer functionality (Lettice et al., 2003; Lettice et al., 2008; Kvon et al., 2016), further studies will be required to see if any individual base pair changes have altered PelB function in these two different mammalian clades that show dramatic hind limb reduction. We note that multiple advanced snake species appear to have deleted a portion of the PelB sequence (Figure 2—figure supplement 2). Interestingly, the corresponding sequence is still present in pythons, a snake that retains small external hind limbs (Leal and Cohn, 2016). Identification of PelB and other enhancers of the Pitx1 gene should make it possible to test whether particular cis-acting regulatory alterations have contributed to evolutionary changes in hind limb morphology in these and other vertebrate species. Sequences from Mus musculus, Homo sapiens, Bos taurus, Tursiops truncatus, Loxodonta africana, Trichechus manatus, Anolis carolinensis, Python bivittatus, Boa constrictor, Pantherophis guttatus, Thamnophis sirtalis, Ophiophagus hannah, Vipera berus, Protobothrops mucrosquamatus, Xenopus laevis, Lepisosteus oculatus, and Gasterosteus aculeatus (Salmon River, clone BAC CHORI213-118G22, GU130434.1; Paxton Lake benthic, clone BAC CHORI215-196J14, GU130437.1) were obtained from NCBI or Assemblathon2 (Boa constrictor, Bradnam et al., 2013), aligned with Shuffle-LAGAN and analyzed with VISTA (Brudno et al., 2003; Frazer et al., 2004). Each BAC clone was co-injected with a minimal promoter-lacZ reporter construct to generate transient transgenic embryos as described (DiLeone et al., 2000). Potential enhancer regions were amplified using primers (Supplementary file 1G) containing NotI restriction sites and cloned into the NotI site of p5-Not-Hsp68LacZ (DiLeone et al., 1998). The resulting expression constructs contain the following mouse genomic regions: PelB (pTCPcbd2-1), mm9 chr13: 55,850,296–55,859,761; PelBcon1 (pTCPcbd2-4), mm9 chr13: 55,850,593–55,852,765; and PelBcon2 (pTCPcbd2-2), mm9 chr13: 55,854,269–55,857,548. Prior to microinjection, plasmid DNAs were purified as described (DiLeone et al., 2000). Pronuclear injection into FVB embryos was performed by Taconic Biosciences and Cyagen Biosciences. Microinjected embryos were collected at E12.5 and stained with X-gal as described (DiLeone et al., 1998). For CRISPR-Cas9 targeting of the PelB locus, potential guide RNAs were screened in cell culture lines for efficacy. Pronuclear injection of the top 4 gRNAs (Supplementary file 1G) into C57BL/6J embryos was performed to generate transient transgenic F0 mice (HHMI Janelia Farms). Eighteen independent tail positive founder mice were bred to produce stable lines. A line containing a clean deletion with breakpoints closely matching the boundaries of the PelB enhancer construct was saved for further analysis. The deleted region in this line corresponds to mm9 chr13:55,850,296–55,859,733. For comparison, the region cloned for the full-length PelB enhancer construct corresponds to mm9 chr13: 55,850,296–55,859,761. Left hind limbs were collected from E12.5 embryos and stored in RNAlater (Thermo Fisher Scientific). RNA was prepared using the RNeasy Mini kit (Qiagen) with the on-column DNaseI digestion step. 400 ng of RNA was treated with an additional DNaseI digestion step (Invitrogen) before cDNA was prepared using SuperScript III First Strand synthesis kit (Invitrogen). qRT-PCR was performed using a 1:20 dilution of each cDNA with primers described in Supplementary file 1G and 2X Brilliant II SYBR QPCR Low ROX Master Mix (Agilent) on a QuantStudio five system (ThermoFisher) using the Standard Curve with Melt 2-step program. All reactions were done in triplicate within an experimental run, and the average of the three values was used for further analysis. Levels of gene expression were determined using standard curves for each primer set, constructed using known amounts of unrelated E12.5 limb cDNA as templates. All mutant and wild type samples were assayed together, and standard curves were performed in each assay to control for plate-to-plate variation. The relative levels of Pitx1 and Pcbd2 gene expression in a sample were normalized to the corresponding level of expression of the reference gene, Pgk1, in the same sample. Male mice were collected at approximately P28. Mice were weighed, skinned, eviscerated, placed in PBS, and then fixed in 95% ethanol for at least 48 hr, with the solution replaced daily. Skeletons were incubated in 760 mL 95% ethanol + 200 mL glacial acetic acid + 50 mL alcian blue solution (2% alcian blue in 70% ethanol). After 6 days of staining, skeletons were rinsed in 95% ethanol for 48 hr, with the solution replaced daily. Skeletons were then placed in 0.8% KOH for 4 days, followed by 1% KOH + 0.00015% alizarin red for 48 hr. Skeletons were then placed in 50% glycerol overnight, followed by 100% glycerol overnight. Skeletons were then transferred to 100% glycerol +thymol crystals for storage. All incubations were done on an orbital shaker for even staining. Mouse skeletal preparations were disarticulated under a dissecting microscope to remove the right jaw, forelimb, pelvis, and hind limb (n = 21 Pitx1+/+mice, n = 20 Pitx1PelB-/PelB- mice; n = 20 Pitx1+/+ mice, n = 25 Pitx1+/PelB- mice, n = 22 Pitx1null/+ mice, n = 22 Pitx1null/PelB- mice). Bones were flattened using a coverslip, photographed, and measured in FIJI (Schindelin et al., 2012). As all bone length traits are correlated with mouse size, residuals from a linear regression on humerus length were used for all traits. Residuals were compared using a two-sided T-test. For patella presence vs absence, a Fisher’s Exact test was used. Mice exhibiting polydactyly were excluded from comparison, and blinding was not part of the study design. Lab-reared fish were raised in 30-gallon tanks under common conditions (2.8 g/L Instant Ocean salt) and fed live brine shrimp as larvae, then frozen daphnia, bloodworms, and mysis shrimp as juveniles and adults. Pelvic development is visible starting when the fish are 7.5 mm standard length, and is considered to be complete by the time the fish reach 16.5 mm (Bell and Harris, 1985). The stickleback pelvic enhancer region was amplified from BAC DNA from either marine fish from Salmon River (clone CHORI213-118G22, NCBI Genbank accession GU130434.1) or Paxton Lake benthic (clone CHORI215-196J14, GU130437.1) using primers with NheI and AvrII recognition sites (Supplementary file 1G). To make directional concatemers, PCR fragments were digested with NheI and AvrII, ligated together, and blunted with Klenow. 2x concatemers were gel extracted and cloned in to the EcoRV site of the pT2HE GFP reporter vector (modified from Kawakami, 2007) to generate either SALR-PelB or PAXB-PelB. Transgenic sticklebacks were generated by microinjection of freshly fertilized eggs as previously described (Chan et al., 2010). Plasmids were co-injected with Tol2 transposase mRNA as described (Hosemann et al., 2004). Mature Tol2 mRNA was synthesized by in vitro transcription using the mMessage mMachine SP6 kit (Life Technologies). All enhancer assays were performed on pelvic-complete stickleback from Matadero Creek, California, USA (MATA). All larvae were raised under standard aquarium conditions to Swarup St 29/30 (Swarup, 1958), when pelvic bud development is initiated, for phenotyping. Larvae were anesthetized in 0.0003% w/v tricaine (Ethyl 3-aminobenzoate methanesulfonate, Sigma). Microscopic observation for GFP expression was conducted with a MZFLIII fluorescent microscope (Leica Microsystems, Bannockburn, IL) using GFP2 filters and a ProgResCF camera (Jenoptik AG, Jena, Germany) to distinguish GFP expression from autofluorescence in pigmented fish. GFP intensity in 24 and 18 independent transgenic larvae carrying Salmon River or Paxton Benthic transgenes respectively was quantified in FIJI (Schindelin et al., 2012). In the green channel, a circle was drawn in the lens of the eye, and the mean intensity was measured. The same circle was placed over the pelvis to calculate mean intensity, and then placed on an adjacent non-GFP region to calculate background fluorescence; the background value was subtracted from the raw pelvic value to generate a pelvic GFP score. Jaw intensity was calculated by measuring mean intensity of a line drawn through the jaw, and an adjacent non-GFP region was measured with the same line for background fluorescence; the background value was subtracted from the raw jaw value to give jaw GFP score. Pelvic and jaw scores were normalized to eye intensity to control for construct integration location and copy number and compared with a Mann-Whitney U Test (Figure 5—figure supplement 4). All primers used in construct design, genotyping, sequencing, and qRT-PCR are listed in Supplementary file 1G. European Journal of Medical Genetics 61:107–113. The American Journal of Human Genetics 74:1239–1248. Teratogenesis, Biology of the Laboratory Mouse, CRC Press. Molecular Biology and Evolution 19:1114–1121. The American Journal of Human Genetics 83:616–622. European Journal of Human Genetics 20:705–708. Canadian Journal of Zoology 70:361–369. The American Journal of Human Genetics 91:629–635. Journal of Embryology and Experimental Morphology 6:373–383. Molecular Biology and Evolution 20:1377–1419. Annals of the New York Academy of Sciences 1409:67–78. Thank you for submitting your article "A novel enhancer near the Pitx1 gene influences development and evolution of pelvic appendages in vertebrates" for consideration by eLife. Your article has been reviewed by three peer reviewers, and the evaluation has been overseen by Marianne Bronner as the Senior and Reviewing Editor. The following individuals involved in review of your submission have agreed to reveal their identity: Neil Shubin (Reviewer #1); Karen E Sears (Reviewer #3). A further reviewer remains anonymous. The authors have previously shown that mutations in regulatory regions of Pitx1 are associated with loss of pelvic appendages. This study identifies a novel enhancer, PELB, in mouse that recapitulates some (but not all) elements of Pitx1 hindlimb expression. Deletion of the enhancer produces some subtle effects on the length of some hindlimb bones. Mutation of the equivalent regulatory region in sticklebacks is associated with reduction in pelvic structures. While all reviewers found the working interesting, they also raised several issues detailed below that need to be addressed by further experiments and rewriting. I have also included the full review of Reviewer 2 for further details. 1) It is clear from this work (and past work) that multiple Pitx1 enhancers contribute to HL expression in mouse. A concern with the present manuscript is that the approach doesn't allow one to see the diversity of Pitx1 enhancers that might be involved. This should be clear in the manuscript. 2) The authors should discuss how the skeletal phenotypes match or don't match the enhancer expression-skeletal abnormalities in the anterior compartment but expression is predominantly in the posterior autopod. It is also worth noting the discontinuity between the mild phenotypes observed in the mouse and the significance that is placed on the enhancer for normal development and evolution of pelvic appendages. Some data showing the effect of PelB deletion on normal expression levels would be very helpful to clarify. 3) Discussion of the pectoral expression domains and the implications this has for normal control of Pitx1 expression and evolution of pectoral/pelvic differences. The RP23-55J18 fragment does not produce the broad hindlimb-restricted domain of the endogenous Pitx1 expression pattern. The PelB smaller fragment contained within RP23-55J18 retains the hindlimb expression domain which is further refined into PelBCon1 and Con2. The expression domain is largely restricted to the posterior autopod. The effect of PelB deletion on expression of Pitx1 is not described (presumably it was too subtle to discern?) but instead the authors document a reduction in length of tarsal and metatarsal bones. The deletion of PelB in mouse does not produce a profound reduction in hindlimb formation. The authors have gone to great lengths to produce statistically significant data but reductions ranging from 2-4% reduction in length are subtle nonetheless. Absence of the enhancer on the background of heterozygous mutation of the Pitx1 gene can exacerbate the patella reduction seen in the Pitx1 het. The effect on the patella is puzzling given the enhancer fragment is shown to have activity restricted to the autopod. How does loss of Pitx1 expression in this domain contribute to patella reduction? Changes in tarsal and metatarsal bones analysed in the PelB homozygous mutant have also been analysed in the pitx1 het, PelB het compound mutant. Results are tabulated in Supplementary file 1F only (could they be in an expanded Figure 3?). This background appears to produce reduction in bones lengths similar to that seen in the PelB homozygous mutant. Would this be predicted or a more profound effect be expected? Mutation of the equivalent regulatory region in sticklebacks is associated with reduction in pelvic structures (the authors make the point that the PAXB population show the most extreme reduction in pelvic loss). The effect on mouse hindlimb formation, however, is very subtle and the domain of expression it is capable of producing in transgenics would indicate this element is not as critical as the authors suggest. Is it possible the PAXB population also carry other deleterious mutations to this locus? I did not find the discussion of the proposal of Osterwalder 2018 helpful as I don't believe the data presented can help clarify a debate on whether multiple functionally redundant enhancers are operating or the converse. This paper describes the isolated case of regulation of a single gene, PItx1. We have clarified the description of multiple Pitx1 enhancers in the Introduction, Results, and Discussion. We also modified Figure 1, and added a new table (Supplementary file 1B), to show the positions of various enhancers described in the literature. We have added a new paragraph discussing different mechanisms by which skeletal phenotypes may arise from the posterior limb expression domain (Discussion, third paragraph). We have also carried out new experiments showing that loss of PelB does lead to a reproducible but mild reduction in the levels of Pitx1 in hindlimbs (subsection “Deletion of PelB enhancer in mouse”, first paragraph, Discussion, second paragraph, subsection “qRT-PCR”, new table (Supplemental file 1C), and see additional discussion below). We have enlarged our discussion of the PelB mutation found in the extremely pelvic-reduced PAXB stickleback population, including the fact that there are no obvious morphological differences seen in the pectoral or median fins of PAXB fish compared to other populations that also show pelvic reduction (Discussion, tenth paragraph). We have also added a new paragraph that compares the time-scale of enhancer evolution in the Pitx1 gene with the larger evolution of pectoral/pelvic differences in vertebrates (Discussion, eighth paragraph, and see further discussion below). As noted above, we now describe changes in both Pitx1 gene expression and morphology in the PelB mutant mice. As noted above, in the revised manuscript, we have added a new paragraph describing different mechanisms by which loss of expression in the posterior domain could give rise to patella and more anterior phenotypes (Discussion, third paragraph). We also list several approaches that could be used in the future to further study this question (including lineage tracing of PelB expressing cells, testing whether there are larger changes in Pitx1 chromatin structure in the absence of PelB, and testing whether PelB mutations also alter other tissues like muscle). PAXB fish have completely lost another pelvic enhancer of the Pitx1 locus (PelA, Chan et al., 2010), in addition to the novel mutation that we now describe for the first time in PelB. The revised Discussion further emphasizes that it may be the loss of both PelA and PelB enhancers that produces the more severe in PAXB fish, compared to other known fish that have only lost PelA (Discussion, tenth paragraph). We also outline how this could be further studied in the future by making engineered mutations in PelA, PelB, or both enhancers together in fish (Discussion, last paragraph). Although our paper describes a detailed study of the single locus Pitx1, we believe the results are relevant to the broader Osterwalder proposal of "redundant enhancers" existing in many genes. In our Discussion, we are also careful to draw out general parallels between our own findings with the Pitx1 locus and comparable expression and genetic knockout studies of multiple hindlimb enhancers that also exist in the Tbx4 gene (Discussion, fifth and sixth paragraphs). The points made thus have wider significance than just a single locus, and we think the results add a useful additional perspective to the literature. We thank C Guo for CRISPR/Cas9 targeting of the PelB region in mice; M Rosenfeld and C Gurnett for null mice; M A Bell and A MacColl for stickleback samples; M A Bell, K Xie, G Kingman, and J Wucherpfennig for assistance in fieldwork; S Brady and E Au for fishroom assistance; and C Gurnett, M Fuller, G Sherlock, D Vollrath, M A Bell, C Lowe, J Wucherpfennig, H Chen, A Kessler, and all members of the Kingsley lab for helpful discussions. This work was supported in part by the Stanford Genome Training Program (5T32HG000044, ACT), a Ruth L Kirschstein National Research Service Award from the National Institute of Arthritis and Musculoskeletal and Skin Diseases (1F31AR068870, ACT), a National Science Foundation CAREER award (IOS-1149453, DBM), the National Institute of Child Health and Human Development (HD081034, DBM), and a NIH Center of Excellence in Genomic Science grant (NHGRI 3P50 HG002568, DMK). DMK is an investigator of the Howard Hughes Medical Institute. Animal experimentation: This study was performed in accordance with the recommendations in the Guide for the Care and Use of Laboratory Animals of the National Institutes of Health. All of the animals were handled according to approved institutional animal care and use committee (IACUC) protocols (#13834, #10665) of Stanford University, in animal facilities accredited by the Association for Assessment and Accreditation of Laboratory Animal Care International (AAALAC). © 2018, Thompson et al.